Sometimes it is hard for baby to be in their crib when they are awake. There can be several toys to amuse them such as a crib mobile can get them engaged looking at beautiful characters. There are many crib mobiles with beautiful music and sounds while these play. It is a colorful mobile with lovely characters. This 3 in 1 mobile is not only for cribs but also for play yards, infant car seats, travel cribs, bassinets and strollers as well. Take Along Mobile by Tiny Love can be used in various cribs, infant car seats, strollers and play yards. It features pleasant music for your baby which continuously plays for 30 minutes. It has various music options and different categories such as: Jazz, nature, world lullaby and classic with various sounds. It also features continuous music of 40 minutes which is also non repetitive and its calming night light provide your baby with comfort while they sleep. 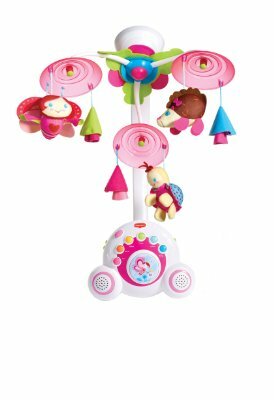 Soothe ‘n Groove Mobile by Tiny Love features 18 different tunes with six categories and it would be liked by babies as well as parents. It is not just for their crib or household mobile; you can also carry it on travels as a music box for your baby. Its two high quality speakers and forty minutes non repetitive music is going to delight your baby for long time. Once your baby grows they can use it as their music box toy which makes it long lasting. It is made from plastic and polyester and features three soothing settings including: music, lights and motion. You can use remote to play it and its leaves start to wave slowly while its smiling dragonfly plays peek-a-boo with music. 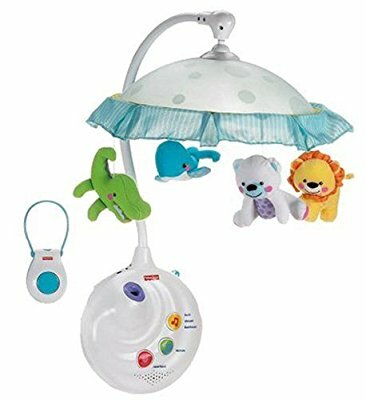 This Musical Mobile by Fisher-Price has multiple functions. It has rainforest friends which move around dancing accompanied by waving leaves with delightful music. When your baby grows and you wish to remove the mobile from baby crib; you can still use the music box for your baby for their glowing night with beautiful music. 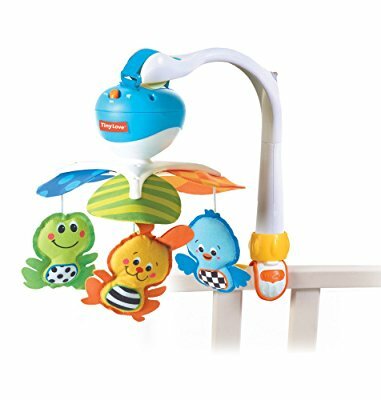 It is 2 in 1 projection mobile is great to use as side mobile for baby crib. 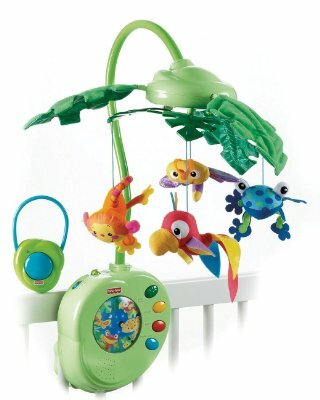 This mobile plays lovely music to soothe your baby. 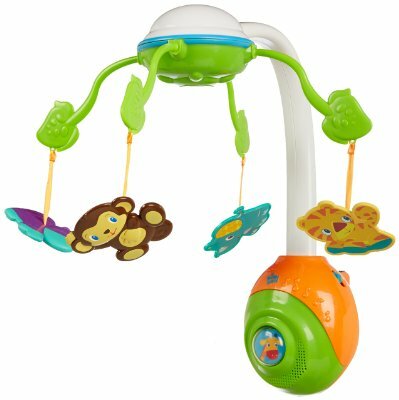 Precious Planet 2-in-1 Projection Mobile by Fisher-Price contains classic lullabies for your baby and soothes your baby continuously for 20 minutes by playing lovely music. The beautiful animal characters spin to make your baby engaged and entertained. It is made from plastic and it features 5 different soothing melodies which continuously play for 15 minutes. It features universal attachment and it has four fun characters. 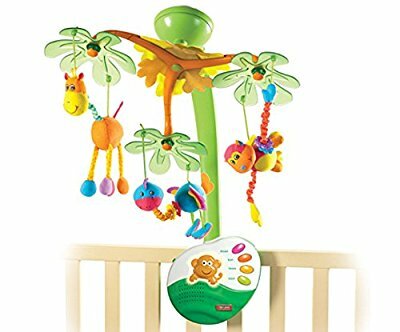 Soothing Safari Mobile by Bright Starts is designed to provide a soothing environment for your baby. It features five different soothing melodies and three silly sounds. Its detachable base can be used as standalone crib toy. This mobile has 2 plush butterflies and 4 spinning shapes as well. It has beautiful characters accompanied with an owl, fox, a raccoon and a bear which entertain your baby. This motorized mobile plays twenty minutes of music and it can fit to crib easily. 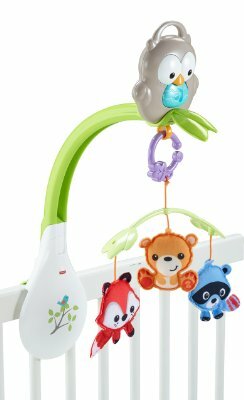 Woodland Friends Musical Mobile by Fisher-Price is not just a musical crib mobile; it is also take-along toy and linkable stroller mobile. 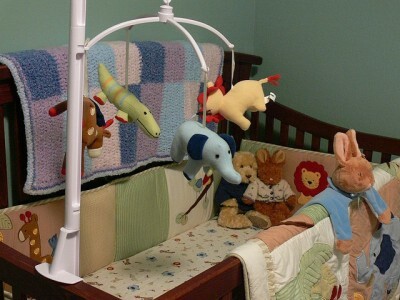 This musical mobile is good to comfy your baby and help them to sleep. This musical mobile is easy to clip to a stroller’s canopy, and you can keep it there while you are on the travels which make it a lot more fun for baby. It contains 5 detachable lovely plush characters and it has vibrant colors. It has mirrored canopy and unique patterns as well. Zolo Mobilo by Kushies is the soft textured crib mobile which is designed to entertain your baby. Its unique patterns and vibrant colors make it more delightful. It also has 5 adorable plush characters to keep your baby engaged for long durations. 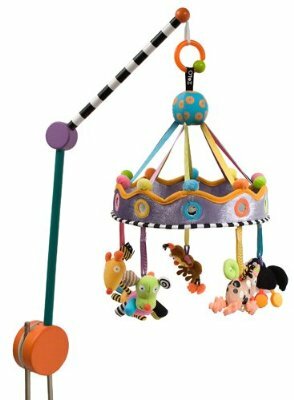 This mobile has circus theme and 2 magnetic animals including bear and a mouse. It also has a mirror and a star and it is recommended for babies with age six months to one year. 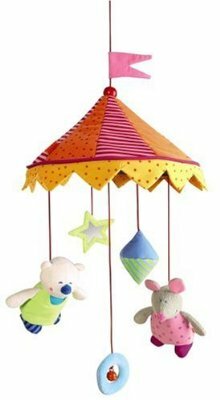 Mobile “Curtains Rise!” by HABA features a circus themed mobile accompanied by 2 lovely characters; a mouse and a bear. The bear’s height is six inches and these are magnetic animals which are detachable also. It features beautiful Island theme design and it has calming night light as well. It plays music for 20 minutes continuously. Sweet Island Dreams Mobile by Tiny Love plays two classical and two special nature tunes. It has lovely animal characters which move in multiple directions. This mobile can easily be attach to different cribs. It also contains a remote control to operate the music box. It contains 4 adorable plush characters and its sturdy arm attaches easily. It is ideal for baby with 0 to 5 months and it is BPA-Free as well. Toy Box Musical Baby Mobile by PlayGro develops eye tracking and sound perception skills for baby. Its gentle melody calms your baby and helps in sleeping. 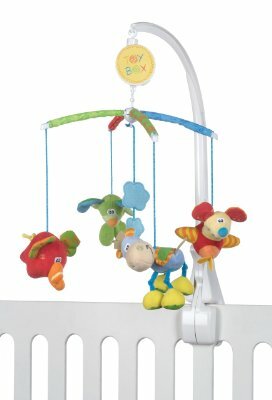 Its lovely 4 plush colorful characters are to entertain your baby and this mobile is easy to attach also.